When asked which places they are planning to visit while in Switzerland, most tourist will mention Grindelwald. Now we know the reason why: Grindelwald is a quaint village tucked in a valley below the peaks of the Bernese Alps. Oh, and there are plenty of unmissable things to, including the entertaining First Flyer and Cliff Walk in Grindelwald First. The train ride from Interlaken to Grindelwald leads through a valley with beautiful nature, raging rivers and majestic mountains. The transfer takes just 34 minutes one way, but we feel like the train was a memorable part of our trip to Grindelwald. 80 km/h. 40 seconds. Simply a blast. We thought riding downhill on a zip line was a refreshing "Swiss" take on thrill rides! The First Flyer zip lining experience is open January through October. Now, watch our zip riding video here! We felt like king and queen of the world! The name speaks for itself, and anyone (including us) who has ever seriously thought about visiting the best of what Switzerland has to offer must have come across Grindelwald. Located just a stone's throw from Interlaken, this is where most tourists will stop on their "Europe in 5 Day" trips. 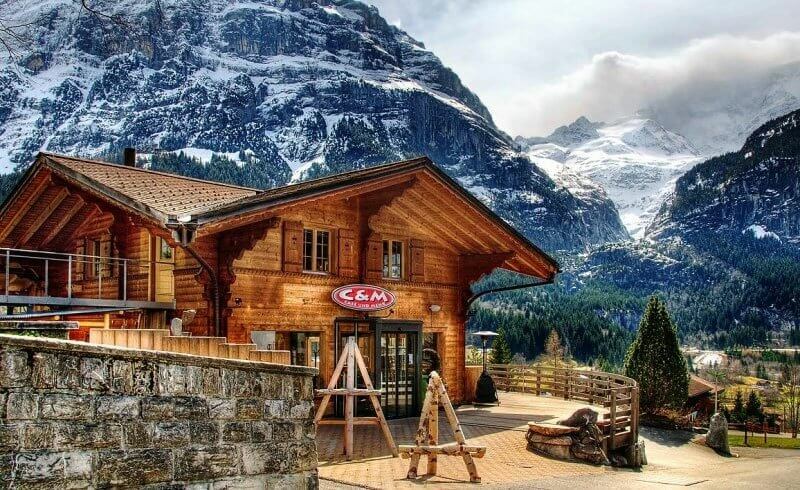 Located across the exit of the First gondola, we sort of stumbled upon the CundM Café Bar Restaurant, a rustic eatery with a huge outdoor patio. This was an excellent choice, as the lemongrass soup and homemade tomato and ricotta cheese ravioli were from heaven! Did I mention the view from the patio was fantastic? The Eiger dominates Grindelwald, as it towers some 1000 m/3000 ft above. It was kind of freaky, because the day after we took this close-up picture, I read a news article in the paper regarding two climbers who had been found dead at the bottom of the Eiger. Can anyone explain what kind of chicken this is supposed to be? Ok, I can read what it says. But huh?